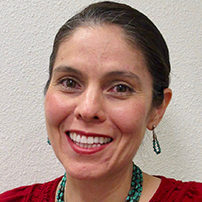 Anita G. Rodriguez, M.S., is a PhD student in Marketing and Plant and Environmental Sciences at New Mexico State University (NMSU). Her research focuses on farming and food industry— practices, manufacturing, policies, and marketing impact on consumers. She previously co-authored a book chapter on genetically modified food product labeling and presented it at an international symposium in Tokyo, Japan sponsored by the OECD Co-operative Research Programme on Biological Resource Management for Sustainable Agricultural Systems and Institute of Economic Research of Aoyama Gakuin University. She conducted more than 140 evaluations for Howard University Center for Urban Progress in Washington, DC. Her diverse employment experience has been in business, non-profit, and government sectors throughout New Mexico, Olympia, Washington, Philadelphia, Pennsylvania, and Mexico City. Currently, she is an Instructor for an undergraduate marketing course at NMSU.